The challenges associated with lack of visibility have traditionally been considered a large enterprise network problem. However, the vast growth of data that businesses of all sizes are facing means smaller companies now more than ever need visibility into their networks. IT teams use an array of tools to monitor networks and applications. Now, they need to provide enterprise-class visibility remote and distributed physical and virtual networks. However, obtaining the complete data needed for in-depth, network-wide analysis is a growing challenge due to increasing network speeds, network complexity, and networks’ dynamic natures. Investment protection is always a key concern for IT managers. You want to seamlessly integrate new products into an existing solution by minimizing and/or eliminating new product training costs by using consistent/intuitive/easy to understand solutions. 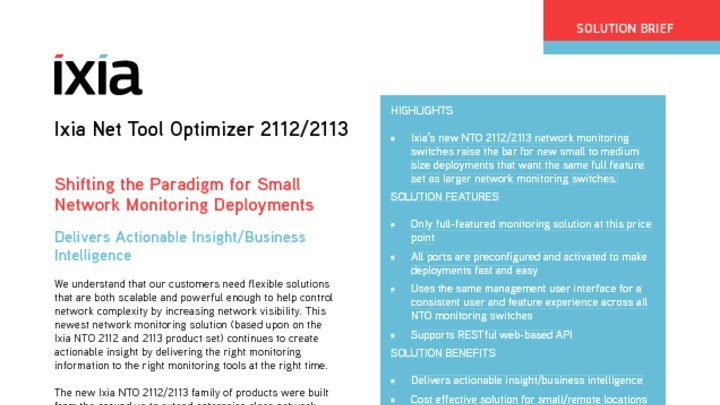 The new Ixia NTO 2112/2113 family of products were built from the ground up to extend core enterprise class network monitoring feature sets to branch offices and distributed deployments. The solution delivers the unique capabilities of the NTO monitoring switch at a cost-effective price. This full-featured platform uses a set of pre-configured monitoring switches that help our customers control costs, protect their investments and provide flexibility to solve their business challenges. This product set provides a new level of scalability for small data center deployments.